Seed boxes have a large capacity for longer intervals between stops for refilling. 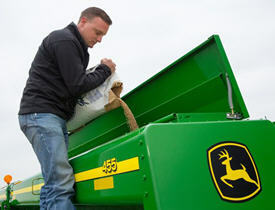 Plain grain or combination grain/fertilizer seed boxes are available to match the producer's needs. The versatile grain/fertilizer box has a three-position divider that can be set for 100 percent grain, 60 percent grain, or 40 percent grain. A sight glass, located near the end of the box, allows the operator to view seed level at a glance. Steel footboards with 25.4-mm (1-in.) diameter perforations allow convenient, safe access to the seed/fertilizer boxes. In-line box design allows quick and easy filling. A grass seeder attachment is available (see attachments in the Ag Sales Manual). The grass seeder attaches to the front of the seedbox and is commonly used for grasses and alfalfa. 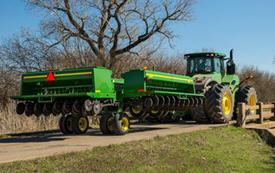 A fully hydraulic front fold/unfold system makes folding on the 455 Drills, for transport a true one-person operation. High opener transport clearance allows moving over ditches, railroad crossings, and other trouble spots without worry. There are four frame-mounted tires: 11L-15, 10 PR rib implement on all three drill sizes. Warning lights are in base equipment for improved visibility when transporting.